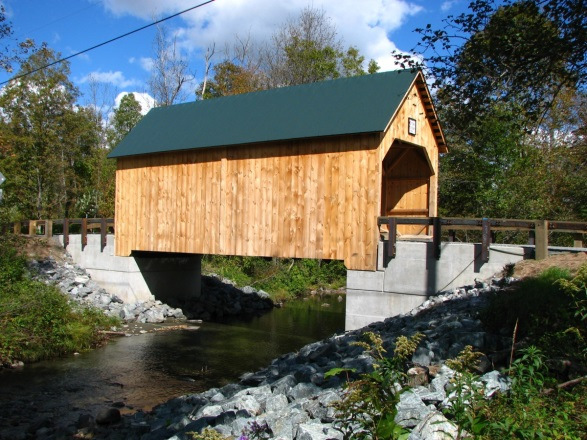 Rehabilitation of the Brown Bridge in Shrewsbury, Vermont, is complete. Built by Nichols Powers in 1880, this Town lattice truss covered bridge was designated a National Historic Landmark in 2014. A dedication ceremony will take place at the bridge on July 5, 2016, from 4:00 PM to 6:00 PM. Please show your support for historic preservation by planning to attend the event. Dignitaries scheduled to attend include Governor Peter Shumlin, U.S. Senator Patrick Leahy, Vermont Commerce Secretary Patricia Moulton and others. Vermont History Expo 2016, to be held on the weekend of June 18 & 19, celebrates The Power of Water in Vermont History. The VCBS booth staffing is complete, and our display celebrating the role of waterpower is under construction. If anyone has an artifact or curio celebrating waterpower, or our covered bridges that should be part of the display, please contact Joe Nelson at jcnelson@together.net. * * * Hyde Hall Covered Bridge Celebration - Save the Date! As many of you know, a lot has happened at the Hyde Hall Covered Bridge in the last 4 years and a celebration is being planned for Sunday, July 17, 2016 at 2 PM to commemorate these exciting changes. This event will take place right at the bridge and is being sponsored by NYS Parks, Recreation and Historic Preservation, Friends of Glimmerglass, Hyde Hall and the New York State Covered Bridge Society. During the event, we will be unveiling the beautiful new Interpretive Sign. Attendees will also have an opportunity to tour the historic Hyde Hall Mansion. If you have any questions or would like to assist, please don't hesitate to contact Trish Kane at: 607-674-9656 or via email: bobtrish68@frontiernet.net. For the first time in my memory we do not have a fall meeting planned. Our next membership meeting is scheduled for April 2017. The original intent of VCBS, supported by our Constitution and By-Laws, was for a spring business meeting for all members, usually with a guest speaker and if feasible tours of the covered bridges in the immediate area. The fall meeting was considered to be more of a social meeting with only minimal business, guest speaker and lunch (or dinner), and bridge tours. The Events Committee has the responsibility of arranging the meetings. At this time the Events Committee is non-functioning, therefore there is no one to make the necessary arrangements. Many of our committees at this time are non- or only marginally functioning. There is no magic genie that will arrange functions, do research on our bridges, write articles for the Bridger, etc. etc. Like any organization, the Vermont Covered Bridge Society can be no more than what its members make it. Obviously we need more members, more younger members, more members willing to take a leadership role in the Society. 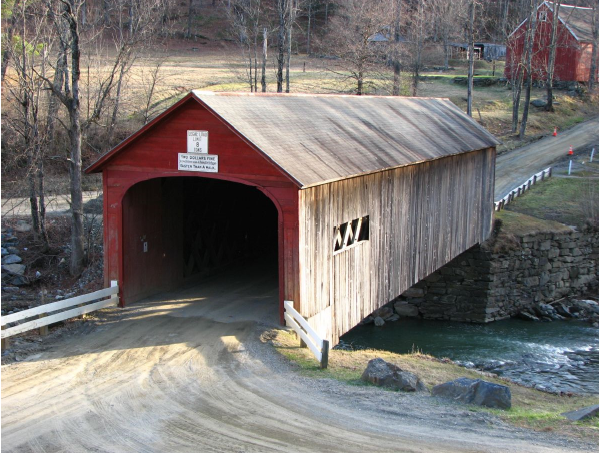 Send news of Vermont covered bridges to editor Bill Caswell at 535 2nd NH Tpke, Hillsboro, NH 03244 or email at wscaswell@yahoo.com. The Longley Covered Bridge was built in 1863 by the Jewett Brothers and is located at the intersection of Longley Bridge Road and VT Route 118. The bridge is an 84' 0" long single span Town Lattice Truss, which spans the Trout River near the northwestern boundary of the Town of Montgomery with the Town of Enosburgh. Several serious structural deficiencies were observed during a routine bridge inspection by Vermont Agency of Transportation (VTrans) personnel in 2010. As a result of the inspection findings, the bridge was posted shortly thereafter for no trucks and a gross weight of 3 tons. The bridge remained opened to traffic until early fall of 2011 when its deteriorated condition prompted the Town to close it to all traffic. Vehicular traffic was bypassed at a temporary prefabricated steel truss type bridge (Acrow Bridge), which was erected downstream of the existing covered bridge. Rehabilitation plans will be approved in upcoming months by VTrans and include the preservation of the original design of the Town Lattice Truss by replacing the trusses in-kind to support a 20-ton design vehicle, installing new floor and lower lateral bracing system, retaining the majority of the roof framing and upper lateral bracing, substructure repairs, application of fire retardant, insecticide and fungicide coatings and installation of new approach timber railing. The project is scheduled to start construction in early winter of 2016 and is anticipated to be completed by early fall of the following year. Structural problems were discovered in the west abutment of the Green River Bridge during wingwall repairs in 2014. Additional repairs designed by Hoyle, Tanner Assoc. will be made by Wright Construction in the summer of 2016. The repairs include straightening the structure, new floor deck, replacement of some floor beams, replacing 1 piece of lower chord, 2 sister lattice installations and some other minor structural repairs. Also new standing seam roof to replace the existing asphalt shingle roof. The Green River Bridge is a 104 foot long Town truss built in 1870. The project is scheduled to begin on May 23 although the bridge will remain open until school closes for the summer on June 20. The bridge must be reopened to traffic by August 27. The West Windsor Selectboard is considering closing Bowers Bridge to vehicle traffic after a number of incidents involving oversized and overweight vehicles. The Board will visit the bridge on May 4th. After being washed away during Tropical Storm Irene in 2011, the bridge was repaired and reopened in the summer of 2012. Within a year it suffered from a broken lower chord caused by a town road grader. An oil delivery truck damaged floor joists. A façade was installed at the portals restricting the height to eight feet. It has been damaged and repaired numerous times after being struck by over height vehicles. The latest damage occurring in early April cost about $800 to repair and will be covered by the truck driver's insurance. The Seguin Bridge will receive some repairs this summer. The work will include new top chords,flooring and floor beams. The contractor will also apply insecticide/fungicide and fire-retardant coatings. Blow & Cote, Inc. of Morrisville, VT, was the low bidder at $431,048.00. Work is expected to begin in mid-June and is to be completed by November. Last quarter we reported that the was damaged when a school bus exceeding both height and weight capacities of the bridge, passed through on Saturday, February 20. Your editor visited the bridge on May 19 and found that the damage has been repaired. The Seventeenth Annual Spring meeting of the Vermont Covered Bridge Society was held in The Visions of Vermont Fine Arts Gallery in Jeffersonville, Vermont on Saturday, May 21, 2016. Twelve people were in attendance when President Bill Carroll called the meeting to order at 10:25am. 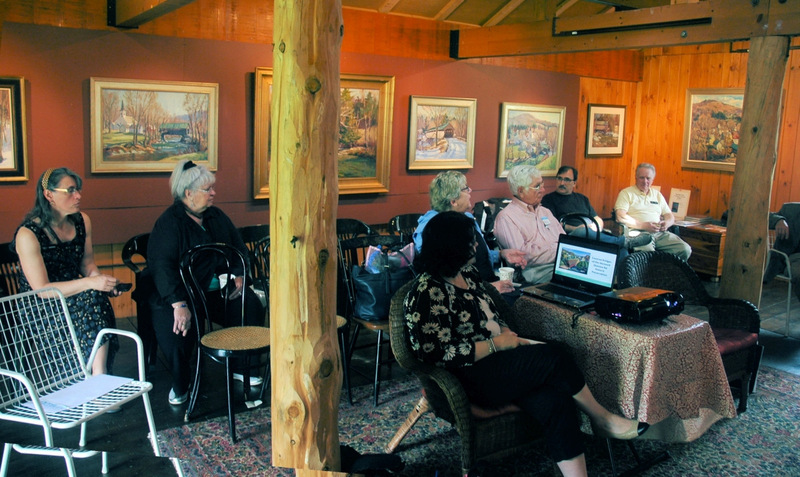 Minutes of the Annual Fall meeting of the Vermont Covered Bridge Society held at the Smuggler's Notch Resort in Jeffersonville, VT on Oct. 3, 2015 were not read as they appear in The Vermont Covered Bridge Society Newsletter - Winter 2015. However, the correction was brought forward by the Secretary, Irene Barna, that the meeting was actually the Sixteenth Annual Fall Meeting of the VCBS. Documentation of meeting sites by town as well as by date was available to verify. The minutes of the Annual Fall Meeting of 2015 were changed from 15th Anniversary Meeting to the read: Sixteenth Annual Fall Meeting. There was no request for a vote on the acceptance of the correction. It is the season for long, winding road trips. Hopefully you'll find some time this summer to take in a couple of covered bridges as you're out exploring our beautiful countryside. At VCBS we fully believe in the preservation of these beautiful historic structures and we're glad to be one of the organizations that support this preservation. Please help us grow our membership. Spread the word about VCBS and why it's important to you and to our communities. Invite your family and friends to be a part. Mention us on social media and encourage people to check out our website and join our Facebook page. Perhaps you could even post a photo or two that you've taken of a Vermont covered bridge on the VCS Facebook page. Let's get the word out about VCBS. An editor is needed for, The Bridger. The duties include collecting articles for The Bridger four timer per year, merging them into PDF format, and forwarding that to the Communications Committee for printing and distribution. The current editor will train. Vermont residency is not a requirement. Steve Miyamoto, our web site guru, is looking into modernizing and reorganizing our website to become www.vermontbridges.org rather than www.vermontbridges.com. "While this change is under construction, I plan to discuss with the VCBS Board of Directors about my surrendering my ownership of the website to the Society" reported Joe. Steve mentioned that information can be posted on the new VCBS web site about bridge size and weight restrictions. Sandy Herligh raised an issue in reference to the website upgrade such as implementing a site tally. She suggested Survey Monkey. Dan Monger wondered why people are not visiting the web site. He asked if a new marketing approach was needed. Irene Barna reported of recent upgrading of lighting in the Pulp Mill Bridge in Middlebury/Weybridge. Several newspaper articles were given to Bill Carroll for their recording in the Archives. It was mentioned that GPS gives no mention of clearances -- resulting in damage to some bridges as drivers simply follow the GPS route and ignore the fact, and not think, that to attempt to drive through a covered bridge their vehicle dimensions will damage the bridge. Ruth Nelson suggested that some of the prints available at the Art Gallery hosting the meeting be available for sale at the VCBS booth at the EXPO as 100% of the profit would go to the VCBS. Those present expressed concern for fellow board member, Johnny Esau, who is facing upcoming medical procedures in Boston. He was wished a successful recovery. State funding: As a new member, Dan Monger asks if there is state funding is available to VCBS for bridge repairs - VAOT ought to know that there are interested people who care about their preservation and importance to the State of Vermont. It was then mentioned that VTRAN does have a Covered Bridge Committee on which VCBS does have a seat. Joe Nelson is usually the member in attendance. Warren Tripp, a VCBS member serves on that committee. Terry Shaw put forth a motion to have the Annual Spring meeting a membership meeting. Joe Nelson seconded. Not all present voted and two opposed the motion. It was then discussed that the fall meeting be a social meeting and the spring meeting be the business meeting. Terry Shaw thinks only one business meeting is necessary -- second meeting being social aka membership-driven. Amended to continue for Board of Directors as is - - Neil Daniels suggested an elaboration on the amendment to read 'one business meeting only'. 11:25. Terry Shaw moves JoeNelson Seconds. The presentation for the morning was by Laura Trieschmann, Vermont's State Historic Preservation officer. Laura, who had been the speaker at the Fall meeting at the Smuggler's Notch Resort, further elaborated at today's meeting on the status of the State support for covered bridges, answering several questions from those in attendance. A question was asked as to why some towns are deferring maintenance of their covered bridge and why the state is not interceding. 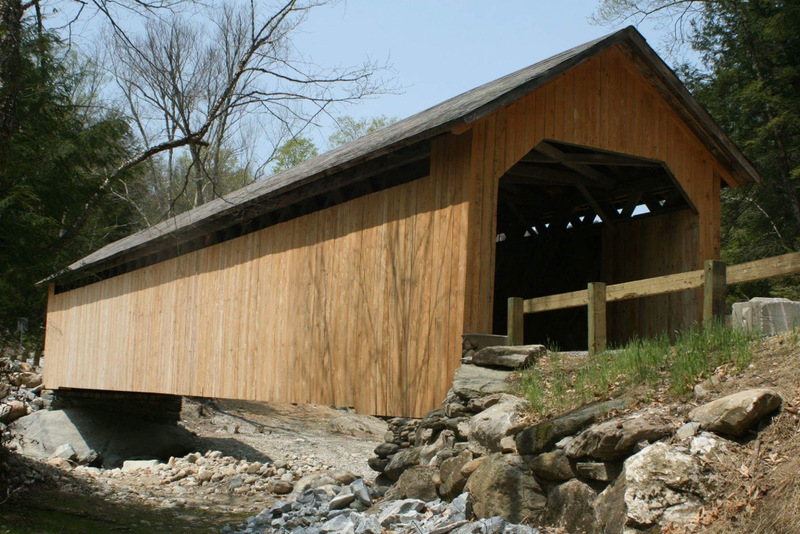 One of the aspects of her official position is to influence further marketing of the covered bridges in the context of their importance to the economy of the state. The Historical Markers Program intends to place the recognizable large free-standing historic markers at all of the bridges that are officially listed as Historic Sites. Paper Mill Village Bridge, Bennington, 45-02-03. Illustrated article concerning removal of the dam by the bridge. Perspective, insert in Rutland Daily Herald, November 11, 2015. Sanderson Bridge, Brandon, 45-11-02 #2. Illustrated article relating to snowplow and truck damage to the bridge. The Reporter , March 23, 2016. Pulp Mill Bridge, Middlebury/Weybridge, 45-01-04. Two computer printouts of photographs of the bridge taken during the 2012 restoration. Google maps. Dingleton Bridge, Cornish, Sullivan Co. N.H., 24-10-02. Illustrated article about the damage caused by an overheight and overweight school bus crossing the bridge. The school bus was carrying students from a school in the Rutland Vt. area for a sporting event and had gotten lost. Many thanks to Irene for saving these materials for our archives. We ask our membership to save any clippings or other documents relating to covered bridges, and send them either to Bill Carroll as Chairman of the Historical Committee or to Joe Nelson. It's the season for long winding road trips. Hopefully you'll find some time this summer to take in a couple of covered bridges as you're out exploring our beautiful countryside. At VCBS, we fully believe in the preservation of these beautiful historic structures, and we're glad to be one of the organizations that supports this preservation. Please help us grow our membership. Spread the word about VCBS and why it's important to you and to our communities. Invite your family and friends to be a part. Mention us on social media and encourage people to check out our website and join our Facebook page. Perhaps you could even post a photo or two that you've taken of a Vermont covered bridge on the Facebook page. Let's get the word out about VCBS. Needed: A recording secretary to support the Society's Secretary..
Hopkins Bridge was built in 1875 by the Jewett Brothers, a lattice truss bridge 90 feet in length across the Trout River in the Town of Enosburg, just a stone's throw from the Montgomery town line. The bridge was found to be unsafe in the late 1990s and was completely rebuilt in 1999. The road through Hopkins Bridge now dead ends at a nearby farm, although the USGS quadrangle map of 1925 shows the road going through to East Enosburg (USGS Jay Peak Vt. 15' quadrangle map, surveyed 1922/1923). In the VCBS archives we have the following: color prints of Hopkins Bridge taken in 2008; color Polaroid print with notes taken in 1987; undated black and white snapshot taken c. 1950s. 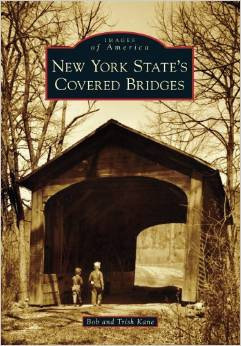 Additional information is available in published works by Joe Nelson and by Ed Barna, both members of the VCBS; and on the website of the Covered Spans of Yesteryear project, www.lostbridges.org. This 57 foot long lattice truss bridge crosses Mill Brook in the Town of Fairfax, a short distance north of the center on Maple Street. The bridge was built in 1865, and is attributed to Kingsbury & Stone, builders (although this is not documented elsewhere) The bridge was washed from its abutments in the 1927 flood, and was later replaced the wrong way around, so that the bridge appears to have a slight tilt. In the VCBS archives we have the following: copies of Kodacolor prints taken in 1993; copy of a Kodacolor print taken in 2008; copy of a Polaroid print with notes taken in 1987. Additional information is available as noted above. Because of the flat terrain and the lack of any significant streams, there are no covered bridges in this County, nor are there any records that there ever were any. Burlington, Vt. June 17, 1939 - Since this writer began hunting and photographing Vermont covered bridges, mostly as a hobby, some five or six years ago, he has discovered that a surprisingly large number of other people are also interested in these old structures. This is particularly true of tourists, who often seem to regard the covered bridge as one of the most characteristic element or the Vermont rural scene. Its sturdy and enduring qualities, weather-beaten though it may be, are typical of the traditional Vermont character, while its venerable appearance delights the eye. Unfortunately, our covered bridges are rapidly diminishing in number, due mostly to the ravages of floods and the demands of modern traffic. Most of those now remaining are to be found on the back roads, where the real charm of rural Vermont can best be seen and appreciated. Formerly tourists hesitated to try the back roads for fear of getting lost, but James Taylor's campaign to have every road intersection in the State properly signed has progressed so far that they need hesitate no more. Of course those whose chief interest is covering the greatest distance in the shortest time will not care to try back roads - but they might regard covered bridges merely as obstructions to traffic anyway. The wooden covered bridge originated in Switzerland nearly 200 years ago, but was never a popular type in Europe, and the early Swiss bridges had been destroyed before the beginning of the covered bridge era in this country. The three most noted of the early American builders were Theodore Burr of Connecticut, Timothy Palmer of Massachusetts, and Louis Wernwag of Pennsylvania. None of these, so far as I know, ever did any work in Vermont, but they built many bridges famous in their day, over the larger rivers, such as the Hudson, Connecticut, Susquehanna and Schuylkill. 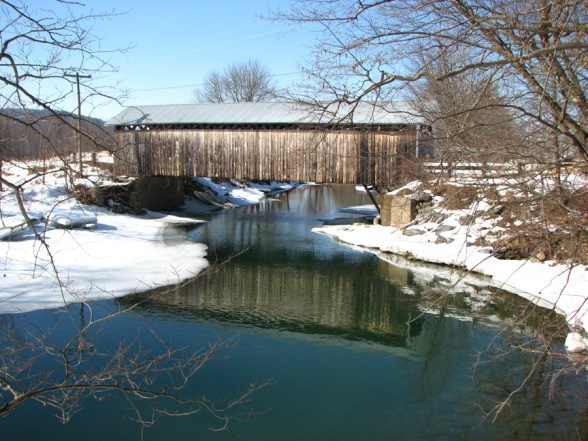 Burr patented in 1817, a type of framing called the Burr truss, which is exemplified in Vermont by the double track bridge built about 1845 over the Lamoille at Cambridge. Incidentally, this is, I believe, the finest remaining covered bridge in Vermont, and should by all means be preserved - no matter what changes may be made in the highway. None of these early designers owed anything to their Swiss predecessors, for the first American bridges were of far more efficient and refined design than those in Europe. In 1820, Ithiel Town, a well-known architect of New Haven, Connecticut, patented the so-called Town lattice truss - the familiar plank lattice, fastened together with wooden pins. Because of its ease and simplicity of construction, this immediately became a very popular type, and doubtless proved quite profitable to its inventor, who charged a royalty of one dollar per foot for the use of his design. 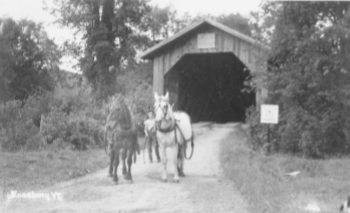 Most of the covered bridges built in Vermont, as well as most of the ones still in use, were of this type. Questions often asked are how many covered bridges are there in Vermont, which one is the oldest, what stream has the most over it, which town has the largest number, and why were they covered? I do not know how many are left, for they have been falling before the march of progress in large numbers recently, but the State Highway Department is conducting a census which will not only show how many but where they all are. The oldest is probably the venerable Paper Mill Bridge over the Otter Creek just north of Middlebury, another double track structure, which is certainly well over a hundred years old, though the exact date of construction has not been definitely fixed. Another fine old one is that across the Mad river in Waitsfield village, built a year or two after the flood of 1830 had destroyed a more primitive bridge. The stream which is spanned by the largest number of covered bridges - about 15 - is Otter Creek, probably because its valley is flatter and it's current more sluggish than most Vermont steams, the Otter does not rise so high nor become so wild in times of flood. And, too, the Otter is the longest river in the State. More than a century ago Timothy Palmer advocated covering bridges in order to protect the timber from the moisture, which would promote decay, and this is, of course, the reason they were covered - not to keep the sun off, nor the snow out. Indeed, in the not so far past days when winter highway traffic went on runners, it was one of the country road commissioner's jobs to "snow" the covered bridges so that the sleds could travel through. I believe that Montgomery, up in Franklin county, has more covered bridge's than any other town in the State, with at least seven still in use - some on very back roads. 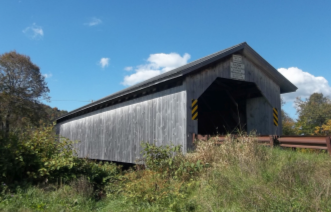 Not only our own highway department, but those of several other states have taken an interest in covered bridges, and some new ones have even been built, though none in Vermont. The youngest one in this State is probably the Moseley Bridge over Stony Brook in Northfield, built 40 years ago, while the one across the Lamoille at Cambridge Junction is only bout ten years older. Half a dozen covered rail road bridges, all but the one on the St. J. and L. C. still remain in service in Vermont, and one of them over the Missisquoi at Swanton, is the longest covered bridge in the State. Those across the Connecticut river are, of course, in New Hampshire, since the Supreme Court made the west bank of the river the state boundary. Certainly there is nothing beautiful about a wooden covered bridge by itself, but they seem to fit the setting of trees, hills, and clear streams in which most of them are found, better than any other type of structure, and they do have an appeal to the heart that steel and concrete never can. Let us hope that the day when the last one disappears from our Vermont highways is a long way off. 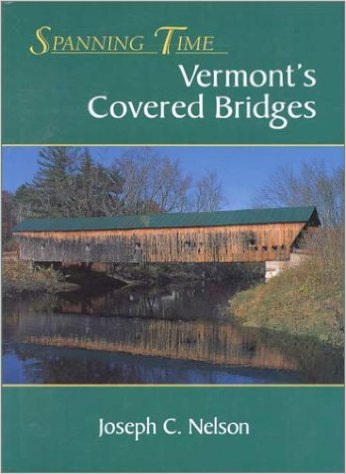 The Vermont Covered Bridge Society Lending Library is featuring a new book produced by the National Park Service, Historical American Engineering Record (HAER), titled Covered Bridges and the Birth of American Engineering, a must read by those dedicating themselves to promoting the preservation of covered bridges. A covered bridge in a bucolic setting has become a quintessentially American image, one meant to evoke a pastoral vision of nineteenth century America. Underneath the housing of a covered bridge, however, is a more complex story. By manipulating a basic form, the triangle, civil engineers and builders developed truss types suitable for different topographies, spans, and modes of transportation. These wood trusses were later adapted for use with metal, which generally usurped wood bridge construction in the first part of the twentieth century. 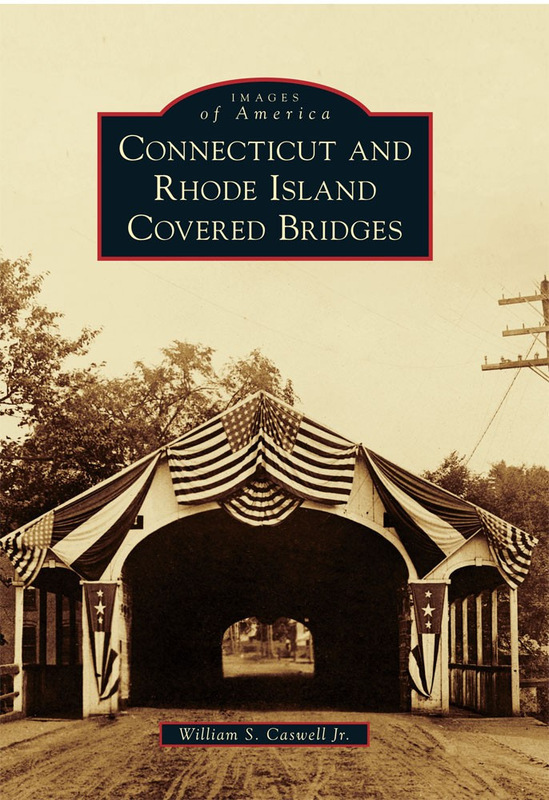 This book examines the development of wood trusses and covered bridge construction, explores the function of trusses in covered bridges, and looks at the preservation and future of these distinctively American bridges. Contact Warren Tripp, P. O. Box 185, South Barre, VT, 05670, fftwbt@yahoo.com, Phone (802) 584-3545.